Maybe I’m the only one but every time I get a new charger for my iPhone, it’s JUST long enough to reach from the socket to my armchair or from the socket to where I want to place the phone while it’s charging. Yes, I am one of those folks that uses my iPhone while it’s charging. I guess that may be ill advised by some but it’s what I do. And I hate when the cord just barely reaches so I can do that. So when I was offered this LAX six foot (yep! 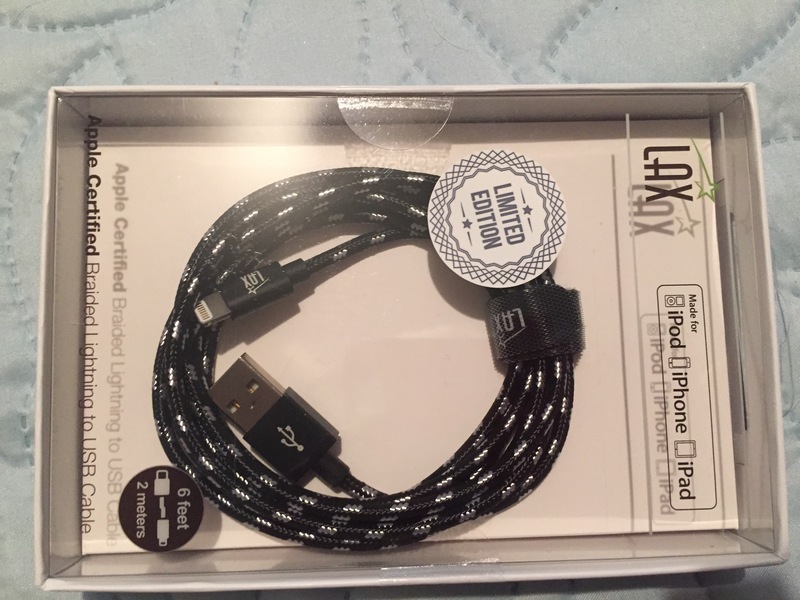 six foot) lightning cord at a discount, I was sooo excited. It’s great! Having six feet is like the olden days of yore when you got that really long phone cord for our Princess phone (if you have to ask what that is…..you are not vintage enough!). You could walk around the room – it was great. So now I can move around and use my phone and talk or read FB or write reviews, etc. The cord, itself, seems very sturdy and I like the design. It does come in different colors if you wanted something other than black and white. Overall I am very pleased with the cord and this brand. I will have to see what other products they have on Amazon.